Sled Island's Green Team worked closely with vendors and our partners to responsibly manage the waste and recycling at 6 different locations during the festival. 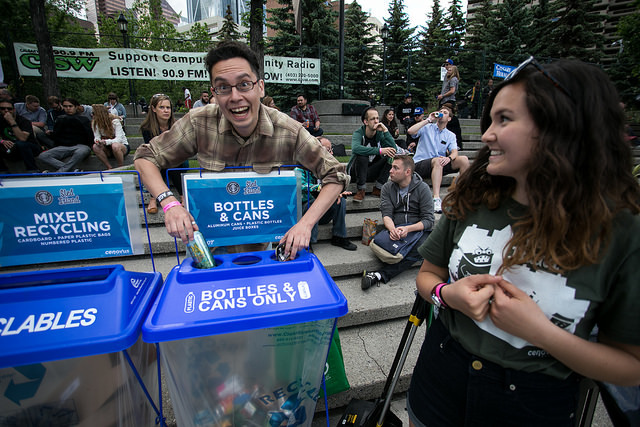 At our main outdoor venues, Olympic Plaza and East Village we were able to divert 88% of the waste from the landfill. A big thank you to all of the food truck vendors for supporting our waste reduction efforts by using 100% compostable packaging and food ware. The best part of Sled Island's environmental initiatives was the reduction of waste in general. This year we generated only 77.33 kg of garbage at our main outdoor sites compared to 425 kg in 2012! Our collection efforts at our other venues including the Golden Age Club, Poster Show, Pass Pick Up, and Artist Lounge helped to divert 300 kg of material from the landfill as well. Thank you to everyone for helping us host an amazing and environmentally responsible festival in 2014!